A couple of weeks ago we posted some memories of how Edisto has changed. Well, after some more glimpses back into the past, here are some more memories of how things used to be. Nowadays, everyone loves the Seacow, but back in the 80s and early 90s, the Schooner was the best place to go for breakfast. This restaurant was located in what is now the liquor store. I can remember we would always stop there before the epic journey back to Ohio after vacation was over. My entire family along with grandparents, aunts, uncles and cousins would all get together for eggs, grits, pancakes and just about anything else before saying goodbye one last time. Once the Schooner was gone, we would still go out to breakfast together, but it was never quite the same. Another favorite place back then was the arcade located in the pavilion. This was located in what is now Coot’s Lounge and it was the place to go for teens in the 80s. My biggest dream back then was to be old enough to go play the games there, but that never happened. It was destroyed by a fire and so I never got the chance to play there. However, arcades have popped up from time to time since then. There used to be one located in Palmetto Plaza in the 90s and another one in the shopping center where the Seacow is located. But, with the advent of handheld electronic games and smartphones, Pacman and Frogger just don’t have the same appeal, and they both closed down. As far as beach activities go, the thing I miss the most is launching our waverunner right off of front beach. The last time this was legal was back in the early 1990s. Waverunners back then weren’t as epic as they are now; they maxed out at about 40 mph, flipped over easily, but were totally awesome. What was even better is that there was a device that could haul a waverunner (or jetski) down to the water so that users didn’t even need to launch from a dock. But, like all good things, this came to an end. People complained that it was dangerous and so launching off of front beach became a thing of the past. However, during the time it lasted, it was amazing. We would launch ours and be out on the water all day long. Sometimes we’d tube behind it and get delightfully beaten by the choppy surf before flipping over backwards into the water. 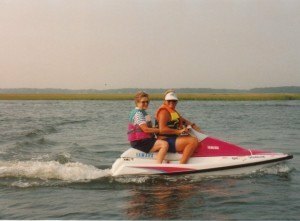 The best times we had on the waverunner were during the afternoons when the shrimp boats would be coming in. Not only were they fun to watch with all the gulls flying around and dolphins following along, they kicked up some killer wake that was amazing to jump over with the waverunner. For vacationers who were slightly more adventurous than I was, they could go parasailing. Parasailing involves being strapped into a device with a parachute attached and dragged behind a boat (not in the water, but in the air). Everyone in my family would go parasailing in the early 90s, but I never did (not a fan of heights or becoming detached and flying off into space). It was a common sight back then to be swimming in the surf or lying on the beach to see a boat go by with a parasailer flying through the air behind it. I’m probably forgetting some more changes over the years, but that doesn’t matter much. After all, Edisto was then and always will be the best place on earth.